I'm not happy with my blogging this week. 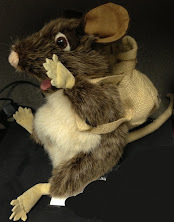 I've been meaning to use Kentucky Packrat as a forum to present original theological posts, such as Joe Missionary's Theology Thursdays (although I know myself well enough that promising a regular schedule with my perpetual procrastination would be blogging suicide :) ). It doesn't help that I have all these good ideas rattling around in my skull, and then one of the WONDERFUL writers on my blogroll write about it first. Of course, it's one against a multitude, that kinda makes the odds uneven. I could blame the dog waking me up every morning, or the stomach viruses (especially since Milady spent Wednesday night catching the virus). I could blame still being worn out emotionally from Number 1 son's pneumonia bout, or even the cold that he cought Thursday, replaying the start of his pneumonia. There is no real excuse, but instead an embarassing reason. I have been trying to deal with some resentment left over from Number 1 son's hospital stay, and it's hurting my walk with the Lord, and thus my writing. My normal method of dealing with resentment is venting against the source of my problem, but I've held back so far. Now I understand why. Number 1 son entered the hospital late on a Saturday night. Sunday morning, I went to church to drop off cookies we'd made for the dinner that afternoon and supplies for the next week's trip to the nursing home. I talked to at least 2 different people on the ministry staff & most of our Bible Fellowship class. By the next week, almost everyone in the church who knew us knew of our son's illness. Milady and I have the weakness of self-sufficiency. We have learned (often the hard way) to rely on each other and on God, but it is hard for us to ask others to do things for us. Therefore, we rarely do. During the time we didn't ask the church staff for help or staff visits1, so they didn't know to come to us, and they didn't. God was meeting our needs well, as my earlier post on the subject says. Our families and the homeschool co-op stepped in before we could ask and met every need we had during this time. Our church (both staff and the members) were deep in prayer for us, and without that prayer Number 1 Son might not even be alive right now. Like a 5 year old upset that you didn't do what he didn't ask, I've been upset that the church didn't do what I didn't ask and God didn't want to use them to do. Rather than realizing my own errors, I stewed in my own mental temper tantrum. Only over the last couple of days have I realized that it's my fault that I didn't ask the Lord for the church to be involved or ask the church members to come to me. My being upset was not rational. It's humbling to think that I have thought myself ready and able to help teach the college class at church, and yet the Lord pushes me a bit and I'm back acting like a baby. I can only hope that I can let the Lord use this as a growth opportunity for me. 1We did ask for shut-in communion one week, and they came for that as soon as we asked.